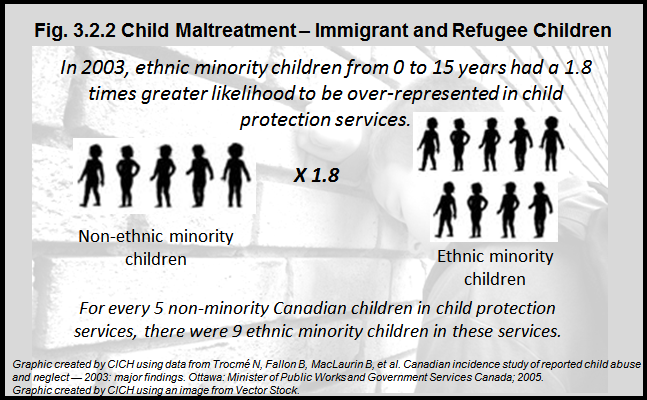 The Canadian incidence study of reported child abuse and neglect (2003) found that ethnic minority children 0 to 15 years of age had a 1.8 times greater likelihood to be over-represented in child protection services, whereas white and Arab children were under-represented. The higher rates were found among Aboriginal, Black, Latino and Asian children (the latter group for only physical abuse).2 Yet, there was no evidence that child maltreatment was higher in immigrant families. Immigrant and refugee families may be particularly vulnerable to the harms that can occur because of legal and institutional interventions consequent to false-positive screening results, such as over-reporting for child maltreatment and unnecessary separation of the child from his or her family. 1Pottie K, Greenaway C, Feightner J, Welch V, Swinkels H, Rashid M, Narasiah L, Kirmayer LJ, Ueffing E, MacDonald NE, Hassan G, McNally M, Khan K, Buhrmann R, Sheila Dunn S, Dominic A, McCarthy AE, Gagnon AJ, Rousseau C, Tugwell P, and coauthors of the Canadian Collaboration for Immigrant and Refugee Health. Evidence-based clinical guidelines for immigrants and refugees. CMAJ 2011; 183(12): E824 – E925. Canadian Immigrant Health Guidelines also recommend that a home visitation program encompassing the first two years of life should be considered for all mothers, including immigrant and refugee mothers, living in high-risk conditions, including teenage motherhood, single parent status, social isolation, low socioeconomic status, or living with mental health or drug abuse problems. For further information on these and other Canadian guidelines, click here.